Believe it or not, your home is a lot more dangerous than you think. There are many obstacles inside of your home including things like loose cords, bulky furniture and carpeting, dim lighting, and slippery floors that compromise home safety. While this may not always be the , if neglected, your home can pose a serious threat to your health. For seniors living at home, it becomes harder to keep the house tidy and clean, especially because with age this requires more effort. While vacuuming, dusting and wiping down surfaces are a common part of any homeowner’s routine cleaning rituals, as people grow older these simple chores can be exhausting and even dangerous for some. As an adult, the idea of your parent(s) or grandparent(s) living in their home without added supervision can be stressful. While you don’t want to overstep and invade their freedom, you also want the best for their health and happiness. Fortunately, there are some simple things that you can do to help improve home safety. As experienced caregivers serving people of all ages in need of home care, we’ve created a helpful list of ways you can increase safety in any home. Consider these suggestions, room by room, to ease your concerns and reduce the risk of a trip or fall or some other type of injury. Living Room: This may be where your mother and/or father spend most of their time throughout the day. This area is often centrally located and used to get from one room to the other. This is why you should begin there. Try and keep this area well-lit and remove any bulky rugs that could be a tripping hazard. While they may be decorative, rugs also cause many trips, slips, and falls. Be sure to remove any clutter that may be on the floors like shoes, books and electrical cords. Check for build up with every visit. Bedroom: The bedroom is everyone’s favorite place to relax and catch a good night’s sleep. Create a safe environment to help your parent sleep better and get dressed without any trouble. As always, remove any clutter from the floor. This is especially important if your parent gets up in the middle of the night to use the restroom. Keep tissues, glasses, and water on the nightstand for easy access. You may have to lower their bed to help them get in and out more easily. For dressing and grooming, make sure that the closet and dresser are organized and that everything is within easy reach. Try to remove items from top shelves as your loved one may try to reach for these without asking for help and risk falling. Bathroom: This area can be extremely hazardous due to a lot of variables. Between the wet floors from showering or bathing, getting in and out of the shower/bath, and issues with using the toilet, there are a number of things to consider when safe-proofing the bathroom. Because most slip and fall accidents occur in the bathroom, you will want to take proper precautions in this room. You or your parent may want to invest in a walk-in tub. If money is an issue, install a shower bench and hand-shower for a cleaning that doesn’t require prolonged standing. Adding hand rails around the bathroom is a good way to improve safety as well. Wet floors may be difficult to control. Place a non-slip piece of carpet or a mat near the edge of the shower or tub. Additionally, placing the towels at the appropriate height and distance can decrease instances of reaching and improve accessibility. Kitchen: Given that the kitchen is another central room in the house, it is important to make it as safe as possible, especially for seniors having difficulty cooking for themselve. Oftentimes kitchen appliances are too high for seniors to use or too bulky to maneuver. Opt for a smaller appliance like a toaster oven that can sit on the countertop and be used for several recipes. Those struggling with dementia have a harder time remembering to shut down appliances or to take dishes out of the oven after being cooked. Keep a handy phone list and telephone nearby if they ever need help. Lastly, expired food can pose a threat to seniors living alone. It’s always helpful to make sure your parent has fresh food and a fully-stocked fridge. Remember to throw away spoiled food. Preparing meals ahead of time with clear labeling and easy heating instructions are great ways to reduce accidents in the kitchen and to ensure your parent remains well fed. Outside: If your parent enjoys spending time outside, gardening, walking a pet, or just relaxing, make sure they have a sturdy, easy way to get in and out of the house. Be on the lookout for common tripping hazards, and don’t hesitate to add a hand rail on stairs. Good lighting is also essential for maximum safety, inside and out. Evaluate every room in a person’s house for home safety. And potential hazards need to be identified and addressed to reduce the risk of injury for seniors living alone at home. As an adult caregiver, it can be worrisome to leave your parent alone, especially if their mobility or memory is declining. Fortunately there are ways to improve home safety, while still giving seniors plenty of privacy and freedom. Caring for elderly parents can be a tricky role, but know that your efforts to improve home safety are beneficial. For those adult children looking for extra full or part time caregiving help, All Best Home Care is here. 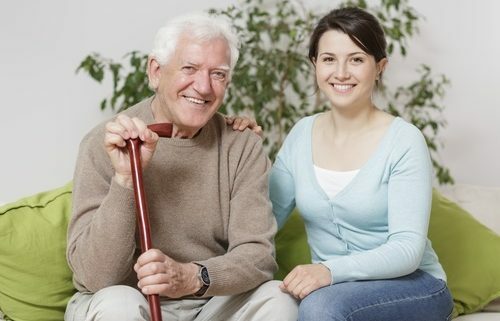 We provide experienced caregiving services in Louisville, and across the entire state of Kentucky. Our caregivers are trained, licensed and certified, and are passionate about caring for others. For more information about our caregiving services, call our office at (502) 456-2273. Avoiding the Flu This Winter Is Your Elderly Parent Reluctant to Accept Help?